Over the past decade, many large companies have focused primarily on protecting their market share from their traditional competitors. However, start-ups such as Uber and Airbnb challenge companies in an unexpected way. 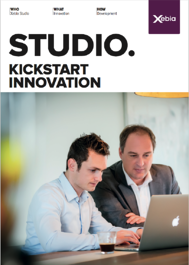 Within the Studio concept, we kickstart innovation in the software development process, the same way a start-up does. In this article, you will read all about this new concept and the value that Xebia Studio will add to your software development process.